I just started researching some exhaust systems (yes, I'm a newbie to the superhawk world and I must say it has me hooked... BAD!) but I currently don't like the exhaust I have on it now. Since winter is hitting soon where I'm at, I was wanting to get a list of mods to fill my winter project list, one being that of the exhaust. I've heard about the Devil exhaust as those are clearly non-existent as I search. I have the year 2000 vtr with some cosmetics I'd like to shed some light to. Any suggestions on other exhausts that I can listen to and other performance benefits from exhausts whether its full systems or just slip ons. 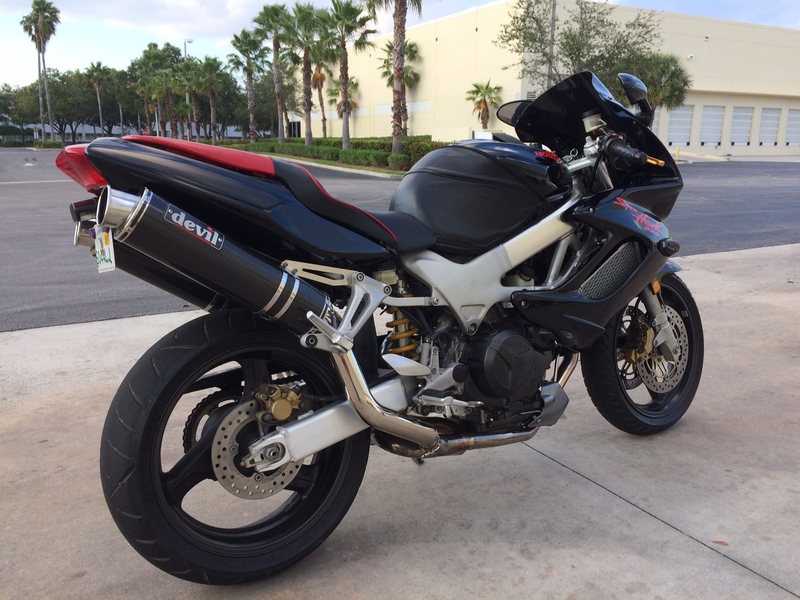 "Any suggestions on other exhausts that I can listen to"
Search in youtoob > Superhawk exhaust or Firestorm exhaust and crank up the volume. Any aftermarket exhaust will be lighter than stock asa benefit - Some will be more freer flowing so might need some rejetting to suit. But be careful hacking with airbox / changing from stock air filter or similar tricks from IL4 book of tuning as V-twin is another ballgame. 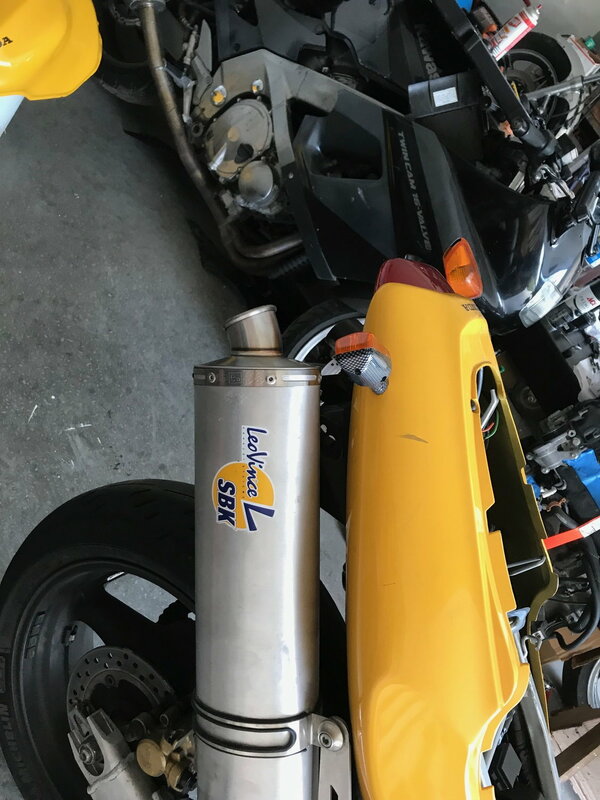 At most you'll be looking at about 5 extra horsies, more possibly with a full 'race' exhaust but don't forget the cost in setting it up properly i.e dyno time etc. what exhaust do you have now and if you buy a new one will you be selling your old one? Welcome to the red headed stepchild of the aftermarket moto world. The full systems are, as far as I know, are not available new anymore. Maybe from the Japanese domestic market, but you will pay dearly for one. Yoshimura, Leo Vince, Staintune (?) are the highest quality brands that still make easily available slip-ons for the SH. Two Bros also, but maybe a step down in quality (no disrespect to those that have them). As Wicky said, beware of Danmoto. There are probably others as well, but availability and cost are going to be proportional inverse. In the used market you're really taking a crap-shoot on what you'll get. I rode with a guy that had Devils. Very nice. I've owned high mount Jardine carbons and really didn't like them. Now I have D&D low mount, and I cut them down a wee bit. Very awesome sound and plenty of it. I also had a friend who owned a VTR for a while and it had the low mount carbon Dan Moto's. They were pretty good for the price. I've also heard Erions which I liked. Staintune has a reputation for being reserved sound wise. All of these being slip-ons. a set of big bore quills or moriwaki...they both sound like somebody being murdered with a chainsaw.. This is what the guy before had on it. And I wouldn't mind selling it if I end up getting a new one, but as of right now, not in the budget. Here are the Devils on my '99. I mean besides the can material (powdercoat your sleeves black) what's the big difference? Last edited by captainchaos; 09-13-2017 at 06:33 AM. would you be interested in trading those leo vince for yoshimuras? I bought it like that and the price reflected! This winter, I'm going to get new fairings with a fresh coat of paint and clean up the cosmetics at the moment. Just having some issues with the response of the throttle, but I think my local mechanic and myself have it narrowed down for sure. Being new to the scene, what may be the difference between the yoshimuras and the leo vince? Curious. If you were to give some kind of an indication of what exactly it is you don't like about the high mount aluminum LVs you're currently running it might be easier for one to point you in another direction... Probably get you to the point faster than simply saying you "don't like" what you have now or "what's the difference between this or that exhaust." You're able to see what they all look like in pics and sound is a completely subjective thing. What exactly is it that you're looking for? the difference between leo vince and yoshimura... that is a tough question to answer in a simple manner. really the main thing would be asthetics, which ones look better. there might be some mechanocal differences but they would be minor. one thing i can tell you is that my yoshimuras are low mount and retain the pass pegs and stock signal light location(lol). i am not a big fan of high mounts but would like to try them. and i also would like to try a leo vince. Well its almost winter and I want to finishe the tank.